Flyer with Arena Head Staff along with Specials throughout the weekend. The vendor applications for the 2019 MJCV Powwow are now available. 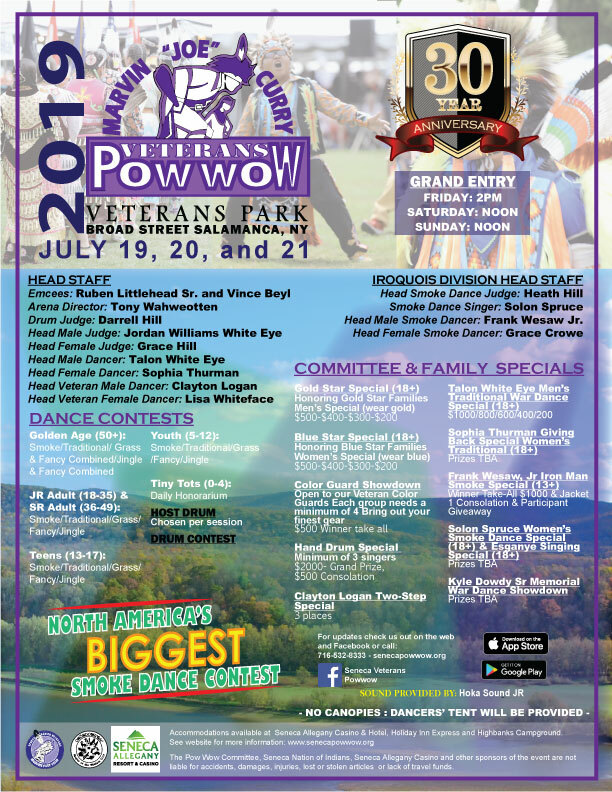 The Marvin Joe Curry Veteran’s Powwow Committee has issued an RFP for Registration and Tabulation services for the 2019 Powwow. Interested companies are invited to submit a letter of interest, statement of qualifications, and a detailed rate and service proposal to the Registration and Tabulation Coordinator. Registration and Tabulation proposals may be divided into the two areas for clarification of rates and services. Rates and Services need to be all inclusive. Please include any information/data involving any tabulation error(s) involving your company and what transpired as a result of the error(s). Selected contractor will be responsible for the expenses of tabulation error(s). Proposals are due Friday, March 1st, 2019. 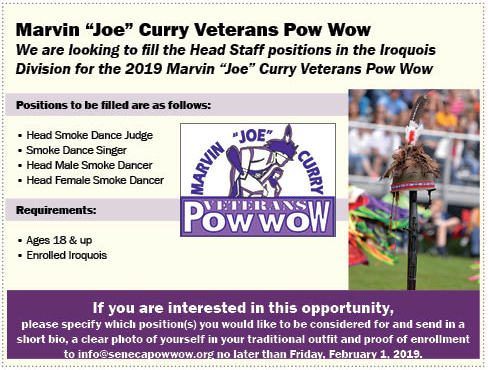 The Powwow Committee plans to schedule interviews the first full week of March and select the contractor by April 12th, 2019. A copy of the RFP is available on the Seneca Nation of Indian’s website at www.sni.org, and on the Powwow website at www.senecapowwow.org. The Powwow Committee desires to enter into a contractual agreement with the selected company. Applicants should be experienced in powwow Registration, Tabulation and able to provide a demonstration of the process to be utilized, in person or via webcast. Applicants should expect to arrive in Salamanca, New York by July 18, 2019, with a departure of July 22, 2019.